So last year's Teenage Mutant Ninja Turtles wasn't great — and many fans were displeased at the "realistic" designs of the Turtles themselves, noses and all. So Three Zero's latest toys being based on those designs may not be the best news, but even then, they still make for some cool looking toys. ThreeZero's 1:6 scale takes on Leonardo and Michaelangelo as they appeared in the film, and problems with the design or otherwise, actuall do a pretty great job. The detail on the turtle's skin is great, wonderfully textured, and all their clothes and stuff fit the figures well instead of looking too bulky (although many fans would argue those clothes shouldn't be there in the first place!). It might not be everyone's favourite TMNT design, but it's hard to deny that ThreeZero didn't nail it. 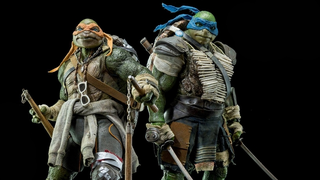 Superfluous clothes aside, the Turtles are accessorised sparingly: Mikey with Nunchaku and a skateboard, Leo with his two Katanas, and of course some spare hands to hold them with. The benefit of these figures is that you could probably remove a lot of the superfluous extra material off of them and come away with something that's a little closer to the traditional design at some point too. Part of many fan's distaste for the designs was their overall busy look. Maybe stripping all of that stuff away would make them look a bit better? No changing the noses though. They'll always be there. Leonardo and Michaelangelo will be available for $230, or in a special bundle for $380, ahead of their release later in the year. If you want one, preorders on ThreeZero's webstore go live on April 9th, at 9am Hong Kong time. That's 9pm EDT and 6pm PDT on the 8th.